Democrats, liberals and progressives of every stripe – you’re not going to want to hear this, but hear it you must. We’ve gone around for too long thinking we’ve got all the answers, but obviously we don’t. Hillary Clinton lost. Donald Trump won. There’s something seriously wrong with what we’ve been doing to get that kind of result. There are some hard truths we’ve got to understand, that we’ve got to learn from. Hearing them may be painful. Many of us will fight against it. But we can’t keep fooling ourselves anymore. All that “hope” and “change” we’ve been waiting for – it has to start with us, first. We’re stuck in a loop and we’ve got to break ourselves out of it. And the only way to get there is to break the track wide open. It’s time to stop mourning. He’s going to protect us by enacting policies to hurt brown people. He’s going to make it harder to get healthcare. He’s going to trample the Constitution. He’s going to offer up our schools to private companies to do with as they please in secret using our tax dollars. He’s going to legitimize white nationalism and embolden racists, bigots, sexist, xenophobes, homophobes and every kind of hate group imaginable. He’s going to hand out tax cuts to his megarich campaign contributors and tax us with the loss of government services. He’s going to use the office as an opportunity to enrich himself and his billionaire buddies and then go on social media and tweet about how he’s fighting for working people. I don’t like it any better than you. But it’s time to face it. Sure, Clinton won the popular vote. Sure, there’s a recount going on in Michigan, Pennsylvania and Wisconsin. I’d love for it to overturn Trump’s victory. But I have zero confidence that it will. And I refuse to let it blind me to the urgent need for change. The first thing we have to do is own up to one essential thing: Hillary Clinton was a bad candidate. The people were crying out for a populist champion. We had one in Bernie Sanders. He would have destroyed Trump, but we blew it. I’m not going to rehash it all again, but there’s no way you can honestly say the Democratic primary process was fair. Party leaders were clearly in the bag for Clinton. They ignored her negatives and what their constituency were trying to tell them. This loss belongs squarely on the shoulders of establishment Democrats. It’s not the fault of the electorate. It was the party’s job to convince people to vote for their candidate. They didn’t do that. Instead they told people who to vote for – or more accurately who NOT to vote for. It was clearly a losing strategy. It lost us the Presidency, Congress and the Supreme Court. Own it. Next we have to acknowledge that this problem is not new. The Democrats haven’t been what they were or what they could be for a long time. Since at least President Bill Clinton, many Democrats have traded in their progressive principles for neoliberal ones. They have sold out their concern for social justice, labor and equity in favor of slavish devotion to the same market-driven principles that used to characterize the other side. Bill Clinton approved NAFTA. He deregulated Wall Street paving the way for the economic implosion. He expanded the failing war on drugs, increased the use of the death penalty, used the Lincoln bedroom as a fundraising condo, ignored the genocide in Rwanda while escalating conflicts abroad in Russia and the middle east. He dramatically and unfairly increased the prison population. He pushed poor families off welfare and into permanent minimum wage jobs. And when people had clearly had enough of it and wanted a change, we gave them Al Gore a.k.a. Bill Clinton part 2. THAT’S why an idiot like George W. Bush won in 2000. It wasn’t because of Green Party challenger Ralph Nader. It was because people were sick of the Democrats not being real progressives. But we clearly didn’t learn that lesson, because we did the same damn thing in 2016. President Barack Obama is just as neoliberal as Bill. He gets credit for bringing back 16 million jobs lost under Bush. But we haven’t forgotten that they’re mostly minimum wage jobs. He gets credit for reducing unemployment to only 4.7%. But we haven’t forgotten that nearly 50 million Americans aren’t included in those statistics because they haven’t been able to find a job in two years and have given up even looking for one. Obama rolled back legal protections that used to stop the government from spying on civilians, that used to stop the military from being used as a police force against civilians, that used to stop the military from assassinating U.S. citizens, that used to protect whisteblowers, that guaranteed free speech everywhere in the country not just in designated “free speech zones.” Not only did he fail to close Guantanamo Bay, his administration opened new black sites inside the U.S. to torture citizens. Obama continued the endless wars in the middle east. Sure, he had fewer boots on the ground, but infinite drone strikes are still a continuation of Bush’s counterproductive and unethical War on Terror. And when it comes to our schools, Obama continued the same corporate education reform policies of Bush – even increasing them. He pushed for more standardized testing, more Common Core, more privatization, more attacks on unions, more hiring unqualified Teach for America temps instead of authentic educators. Voters clearly wanted a change. We wanted a real progressive champion who would roll back these neoliberal policies. Instead we got Hillary Clinton a.k.a. Obama part 2. The Democrats didn’t learn a thing from 2000. We just repeated the same damn mistake. And some of us still want to blame third party candidates like Jill Stein. It wasn’t her fault, and it wasn’t voters faults. It was the Democratic establishment that refused to listen to their constituency. So here’s the question: will we do it again? Will we let party insiders continue in the same neoliberal direction or will we change course? Re-electing Nancy Pelosi to House Democratic leadership isn’t a good sign. She represents the same failed administration. But we’ve kept her in place for another term, repeating our mistakes. Maybe we’ll make a change with U.S. Rep Keith Ellison as DNC chair. It would certainly be a good start to put a real progressive in charge of the party. What better way to challenge Trump’s anti-Muslim propaganda than by promoting the only Muslim representative in the House to the head of our movement! That’s a sure way of showing that Democrats include all peoples, creeds and religions in contrast to the Republicans insularity. But there’s no guarantee we’re going to do it, and even if we did, it would only be a start. We need to take back what it means to be a Democrat. We can’t have organizations funded by hedge fund managers and the wealthy elite pretending to be in our camp while espousing all the beliefs of Republicans. We can’t have Democrats for Education Reform, a group promoting the policies of George W. Bush, the economics of Milton Friedman and prescribing laws crafted by the American Legislative Exchange council. We don’t need Cory Booker going on Meet the Press to defend Mitt Romney against income inequality and then pretending to champion working people while taking in contributions from the financial sector. The brand needs to mean something again. The party needs to move in an authentic progressive direction. So we need to get rid of all the neoliberals. They can go become Republicans. All it would take is exchanging in their blue ties for red ones. They’re functional Republicans already. We’ve got leaders who can take their place. We’ve got longtime progressives like Bernie and sometime progressives like Elizabeth Warren. We’ve got younger statesmen like Nina Turner, Tulsi Gabbard, Jeff Merkley, John Fetterman, and Jesus “Chuy” Garcia, to name a few. But we need new blood. Of course none of this matters if we don’t take steps to secure the validity of our elections in the first place. We need to reform our entire electoral process. Ancient and hackable voting machines, voter suppression laws and efforts, rampant gerrymandering and, yes, that stupid relic of the slave states, the Electoral College – all of it must go. We’ve got to ensure that people can vote, people do vote and it actually counts. And if something goes wrong, we need a way to double check. Recounts in close races should be standard and automatic. We’ve got to fight Citizens United and other Supreme Court rulings equating money with speech. We’ve got to run people-powered campaigns like Sanders did so our politicians aren’t so beholden to corporate and wealthy interests. We’ve got to make it easier for third parties to be part of the process, to include their candidates in debates, etc. These are some of the many challenges ahead. Sure, we have to fight Trump. But the best way to do that is to reinvent ourselves. If the Democrats aren’t willing to do that, many of us will go elsewhere. The party cannot continue to exists if it continually ignores its base. It’s not enough to give us a charismatic leader to latch onto – we need real progressive policies. The next four years are going to be hard. Trump is going to make things very difficult for the people we love. But in a way that’s a blessing. We have a real opportunity to create an authentic resistance. People will be untied in their dissatisfaction and anger at what Trump is doing to the country. They’ll be looking for somewhere to turn, for a revolutionary movement to lead them through it. We can give them another fake insurgency as we did against Bush. Or we can learn the lessons of history. We can move forward. We can change. We can become a party of real progressives. Or if we need – we can start a new one from the ground up. Progressive challenger Chuy Garcia lost his bid for Chicago Mayor. Neo-liberal Rahm Emanuel won re-election. It’s a headline that shouldn’t surprise anyone – but it does. All the polls told us this would happen. Rahm just had too much money. 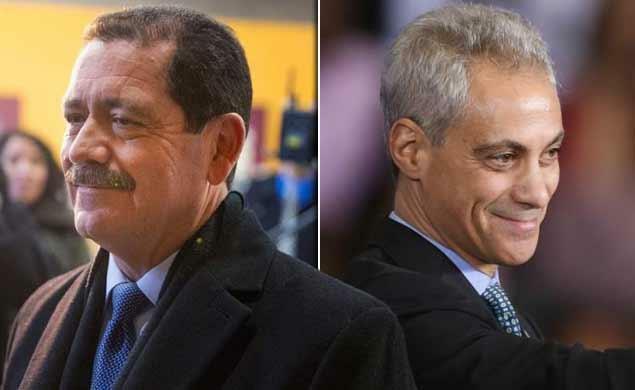 Emanuel raised nearly $23 million compared to Garcia’s little more than $6 million. That buys an awful lot of television commercials, advertisements, and confidence. Emanuel had 20 different ads that aired over 7,000 times! Even if you aren’t paying direct attention to it, after a while that kind of repetition seeps into your bones. Even if you don’t want it to be true, even if you fight against it, there’s a part of you that can’t help but believe it. It’s like being trapped in the coils of a monetary anaconda that looks you right in the eyes as it squeezes the life out of you and unhinges its jaw! How else could Rahm win? His attempts to goose the city’s sluggish economy were nothing but an attack on the poor and minorities. He closed public health clinics, 50 public schools and installed red light cameras to raise fees. And none of it even worked! You might think it’s counter-intuitive that money matters so much, but history disagrees. This is how it plays out almost every time. The candidate with the most green wins. Gov. Andrew Cuomo raised $30.5 million fending off challenger Zephyr Teachout. She raised only $600,000. And we all remember how that turned out. Without the constant stream of campaign ads and only the bad taste of his actual policies, Cuomo’s popularity now is lower than it’s ever been. And that election was only half a year ago! Buyers remorse? Sure! But just wait until the next campaign and a truckload of donor’s money to temporarily hypnotize people they should think otherwise and voila! Instant approval. Just add money! But there’s good news in this nest of vipers, too. Consider this: both races were internal. These were Democrats vs. Democrats. But were they really? Rahm’s top donors were conservative billionaires. These are the same folks backing Scott Walker, Mike Pence and Mitt Romney! The media is trying to spin this as the Elizabeth Warren wing of the party vs. the business wing. Nonsense! It’s real, grassroots progressives vs. the DINOs – the Democrats In Name Only! And the DINOs keep winning! But take heart. The future doesn’t belong to dinosaurs. Look at how far Chuy Garcia pushed Rahm Emanuel! He got enough votes in the primary to force this runoff election. It was no cakewalk for Emanuel. The people lost this one, but we will remember it. Neither of these were high turnout elections. We don’t have that anymore in America. No matter who is running, no matter what’s at stake, the public is so gripped by a sense of helpless apathy that most people don’t even show up at the polls to cast a vote. But every time we have an election like this one, we stir people up. We fill them with passion. We make them care. I knew Chuy Garcia had very little chance of winning, but I wanted it anyway. I read up on him, talked to people, posted on facebook, sent out a barrage of tweets every day. And I’ve never even been to Chicago! But Chuy’s campaign meant something to me. It still does. Even with the election lost. There is a growing majority of people who feel the same way. We care about closing 50 public schools for minorities. We care about local government control. It matters to us that our society is run justly, morally, progressively. We repudiate the business model, the worship of money and profit at the expense of all else. And there are more of us everyday. Yes. In the short term, money still rules. But what happens on the day when they open the polls and we all show up? What happens when that passion spurs us – all of us – to actually get out and vote? What happens when we drown out the drone of campaign commercials with the certainty of what is right? I think on that day, the Rahm’s and Cuomo’s will fail. On that day the DINOs go extinct. On that day, we take back our party and our Democracy itself. NOTE: This article was also published in the LA Progressive and the Badass Teachers Association blog.